Car stop leads to gun arrest. On March 2, 2019 at approximately 1:30 PM, Officer Williams was working traffic enforcement. Officer Williams stopped a vehicle for unsafe speed in the area of Sunset and Railroad Avenue. During the traffic stop, Officer Williams recovered a loaded handgun from inside the vehicle. 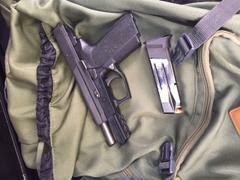 The handgun was stolen from a residential burglary in Sacramento. Arrested was the driver of the vehicle, Antoine Copeland, a 20-year old Suisun City resident. There was also a seven-year-old child in the vehicle at the time of the stop. Copeland was booked for weapon charges and child endangerment. Traffic enforcement is an important duty for police officers to help reduce collisions on our roadways. Oftentimes these stops lead to other criminal offenses, and in this case with one less gun on the street.